Of the various leisure activities for the Victorian woman, none is, perhaps, more interesting than hair work to create jewelry. During the mid-nineteenth century hair work became a popular drawing-room occupation, as fashionable as the much-practiced knitting, netting, and crocheting. 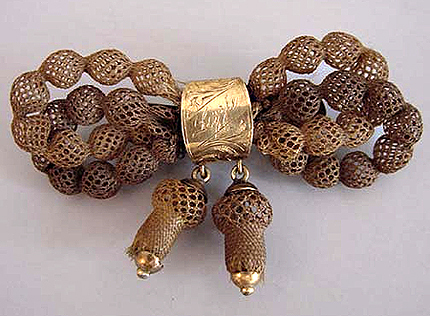 By acquiring knowledge of this art, ladies were able to manufacture the hair of beloved friends and relatives into bracelets, chains, rings, earrings, and thus insure that they could actually wear the treasured memento they prized. The objects which were made in hair are more numerous than is generally supposed. 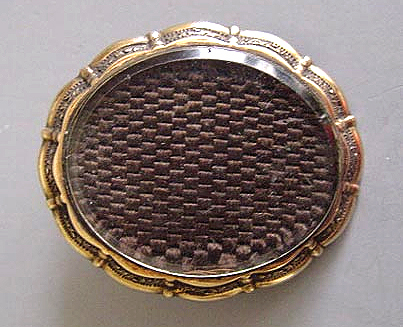 An ingenious Victorian hair-worker thought of many little domestic articles which could be either made of hair or ornamented with it. The following were some of the commonest applications: bracelets, brooches, earrings, rings, chains, necklaces, shawl pins, cravat pins, purses, bags, book markers, pencil cases, guards, studs, stud chains, scent bottles, walking sticks and even riding whips. 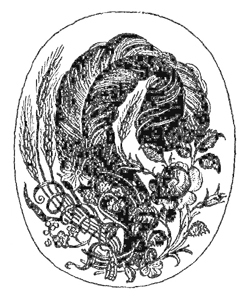 It may seem strange to learn that the most beautiful pieces of hair-work were created upon so simple a frame as a hat or a bandbox, and that even a decanter was sufficient to make various small articles in hair. 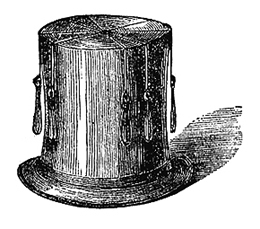 At times, the bottom part of a bandbox was turned upside down or a hat was stood upon its brim. In either case, a flat table was made, in the center was cut a small round hole, just large enough to put a finger in. If the hole made in the top of the hat or the bandbox was ragged at its edges, pieces of paper were pasted over the rough parts before it was used. Another form of frame was a wooden cramp screwed onto the projecting rim of a table or the corner of a mantle-piece. 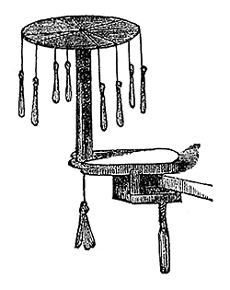 Whether this apparatus, or a hat, or a band-box was used as a frame, a circular piece of white paper was pasted over the table, and a hole made in it corresponding with the hole in the table. Freestanding frames were also used, and the most popular were those small in size and light in weight. A braiding table was very simple in its construction, and cost little; the chief thing necessary was that every part of it was perfectly smooth, as the least roughness would tear the hair and destroy the evenness and beauty of the work. 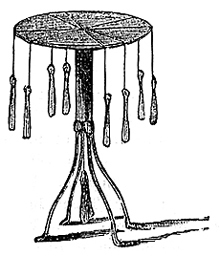 There were two varieties of braiding tables; the first, or "ladies' table," stood about thirty-two or thirty-three inches high; the second stood nearly four feet high. The latter table was preferred—although it was more fatiguing to stand than to sit, more command of the work was obtained. Furthermore, with the smaller braiding table, ladies' dresses, when sitting, interfered with and disturbed the weights and their respective strands. 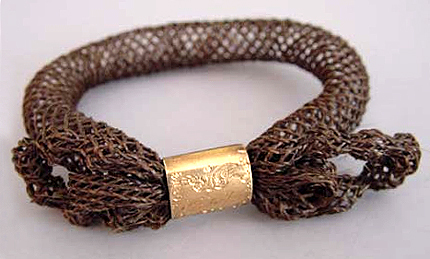 Table braiding is similar to Japanese KUMI HIMO. You can find a braiding table at the Halcyon Yarn web site to try your hand at making your own hair work keepsakes. This type of hair work depended more on the artistic skill, creativity and practice of the worker rather than on any instructions given. For working these, ivory—such as miniature painters use—short lengths of hair (from two to four inches), thread, and gum dragon are all the materials required. For tools, a fine edged penknife, a very delicate pair of scissors with fine sharp points, a couple of pencils, a fine long pin, and a palette were necessary. The popular lady’s magazines of the era often provided directions and pattern designs for creating these cherished keepsakes. The following are instructions provided in a series of articles in Godey’s Lady's Book in the 1850s. "Sort the tress, which is about to be used, into lengths, tie the ends firmly and quite straight with pack thread, put the hair into a small saucepan with about a pint and a half of water, and a piece of soda of the size of a nut, and boil it for a quarter of an hour or twenty minutes; take it out, shake off the superfluous moisture, and hang it up to dry, but not near a fire." "When it has become perfectly dry, divide it into strands containing from twenty to thirty hairs each, according to the fineness of the hair or the directions given for the pattern about to be worked. It must be observed that every hair in the strand should be of the same length, and the strands should be all of an equal length." 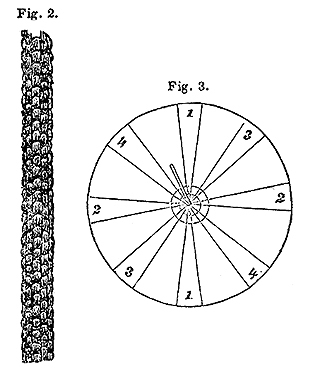 "Knot each end of each strand, then take the requisite number of leaden weights, weighing about three quarters or half an ounce each, and affix about a quarter of a yard of pack thread to each of them; lay them down side by side on the table, and to the other ends of the pack thread affix the strands of hair already prepared, knotting them on with a weaver's or sailor's knot; care must be taken all this time to prevent any entanglement or derangement of the hair." "The other ends of the strands must now be gathered together, firmly tied with pack thread, and then gummed with a cement composed of equal parts of yellow wax and shellac melted together and well amalgamated, and then rolled into sticks for use. We now come to the table and the arrangement of the strands on it." "Figure 1 will exemplify the following directions. To the tied and cemented cluster of ends attach a loop of pack-thread, and hook this on to the small hook in the hole in the center of the table; then lift each strand gently and separately off, and arrange them all smoothly and evenly round the table in the proper order for working the pattern; this done, affix the balance-weight (a collection of three or four similar to these attached to the strands) to the loop in the hole, and allow it to hang down exactly in the center of that hole; a brass tube or wire of the requisite size for the pattern about to be worked must now be placed in the center, with one end of it resting on the hook where the loop of pack-thread has just been taken, and the work is ready to be commenced; each strand having been first examined to see that no loose hairs hang about." "When the pattern is completed, the center or balance-weight must be detached, and then the pack-threads holding the other weights should be gathered together and cut off. Afterwards, smooth the short ends of the strands of hair on the tube and lay them tightly down to it with thread; then cut off the cemented end, and lie these parts also down in the same way. Take the tube and immerse it in scalding water, and let it simmer there, with the hair work on it, for about ten minutes; withdraw it, shake off the superfluous moisture, and hang it up to dry, not too near a fire; when thoroughly dry, the work must be gently and carefully slid off the tube, each end separately cemented with the before mentioned composition, care being taken to gather up every hair, and the pattern will appear complete and ready to receive whatever clasp, snap, or slide it is thought proper to affix to it." "Sixteen strands of twenty-five or thirty hairs each, according to the fineness of the hair. For this pattern the strands must be arranged in fours, and numbered." "Take the strand which lies on figure 1, at the bottom of the diagram (Fig. 5), and move it towards the left, and into the place of the next figure 1 strand, lifting that and carrying it to the top of figure 1 strand, while this latter in its turn must be removed to the place of the right hand figure 1 strand, which goes to fill the vacant place of the one first lifted at the bottom. Proceed now to figure 2 of the bottom group, and work the strands numbered 2 round in the same way, and in the same direction. The next strand to be raised is figure 3 of the bottom group, and this is to be worked in the same way, but in the opposite direction, that is, towards the right and into the place of strand 3 on the right of the X, which in its turn goes to the top, and the top one to the left, while that from the left hand group comes to the vacant figure 3 at the bottom. Figure 4 is worked in the same way and direction as the threes; then recommence at 1." "The point to be observed is to move the ones and twos towards the left, and the threes and fours towards the right; always beginning from the bottom group. This pattern should be worked on a brass tube of the thickness of an ordinary lead pencil, or rather larger; and it looks very well over another and closer plaits. Each must then be worked separately and when finished, and perfectly dry, the smaller one should be passed through the larger, and the ends of the two cemented firmly together. For such purpose, we should advise that the Fig. 2 pattern should be worked on a larger wire, perhaps of the size of a No. 10 knitting needle." 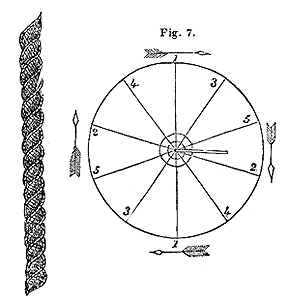 "For this pattern, sixteen strands, each consisting of about twenty hairs, are required. These must be arranged in pairs on the circle on the table, at equal distances, and so that the opposite pairs shall be in direct lines with each other." Take up the two bottom strands over figure 1, and remove them to the position of the opposite pair over the opposite figure 1, bringing back that opposite pair to the position before occupied by those just removed. Proceed then to the pair of strands over the right hand figure 2, and in the same manner lift them into the places of the strands over the opposite figure 2, and bring these latter back. Work those over figure 3 and figure 4 in the same manner, lifting those from the right hand side over to the left, and bringing the latter back." "Then recommence at figure 1, and repeat this pattern until the hair is worked up; remembering never to cross the strands, but simply lift them over gently and without jerking from one side to the other. 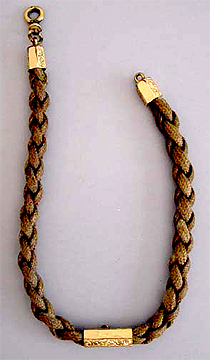 This chain may be worked in pieces of three or four inches each, and then united with gold slides, or in only two or three portions, or in one continuous length; but this latter plan would require the hair to be longer than we can usually obtain it, namely, from fifteen to twenty inches or more in length. It should be worked on a brass wire of about the size of a No. 15 or No. 16 knitting needle." 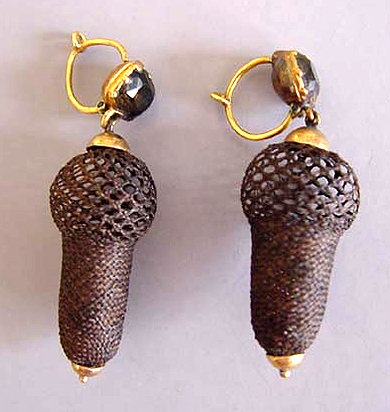 Earrings were usually worked with moulds rather than tubes or wires. 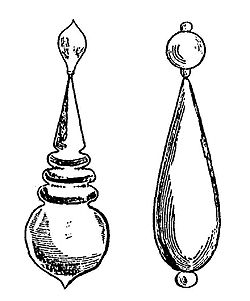 Below are examples of three molds illustrated in Godey's Lady's Book. Take figure 1 from the bottom, and move it round in the direction pointed out by the arrows into the place of figure 1 at the top, bringing that round and down to the bottom; so on with the twos, threes, fours, and fives, always working in the direction pointed out—namely lifting the right hand strand into the place of the left, and that round to the right: they should be lifted round, and not crossed over. A wire about the size of a No. 15 knitting needle will do best to work this on. Bear in mind that the strands are to be worked in the order in which they are numbered." 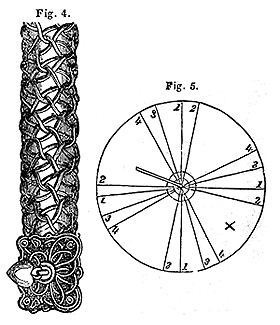 "A very pretty bracelet may be made with this pattern by increasing the size of the strands (putting from thirty to thirty-five hairs in each), and working on a tube of the size of a No. 6 knitting needle. Three lengths of the pattern must then be made, and twisted together so as to form a kind of rope or cable, and firmly cemented together at the ends." "Thirty-two strands of from twenty to thirty hairs each, and arranged in groups of fours, as evenly as possible, are needed for this pattern, which may be worked on a tube of the same size ordered for Fig. 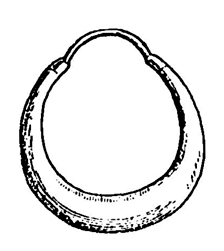 4 pattern, or on a flat brass mesh about half or three-quarters of an inch in breadth, or on a mould large at one end and diminishing towards the other. 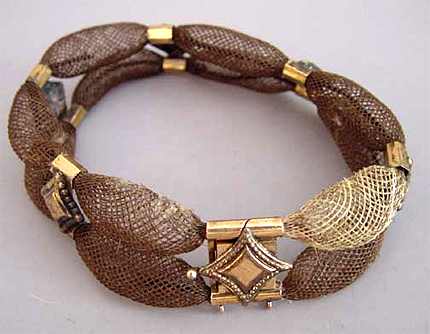 In this latter form, it constitutes the fashionable snake bracelet." Take the outside right hand strand of the first group of four immediately on the left of the cross, and pass it over the one next to it; take the outside left hand strand of this same group, and pass it over the two next to it; repeat these movements with this group, and then proceed to the next four, and work them in the same way; and so on all round the table, until you again come to the cross. This forms the first part of the plait." "Then take two strands from the right of the cross and two from the left of it, to form the group of four, and rearrange the fours all round, taking the outside twos of each neighboring set to form the fresh grouping. Begin as before with the four immediately on the left of the cross; take the two middle strands, and pass them over the outside ones, and then under them, and so into the middle again; cross the left hand middle strand over the right hand one, then pass the right hand outside strand over the two middle ones, and then the left hand outside strand over the three others; proceed to the next group of four and work them in the same way, and so on all round the board. The pattern is now complete; the strands must be restored to their original places and groups, and we recommence with the first part of the plait." 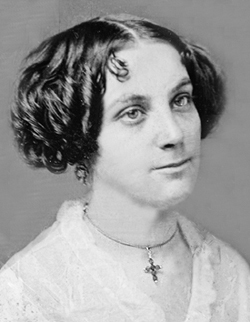 "In working this pattern, great care must be observed in the altering and restoring the arrangement of the strands in their several groups at each change of the plait. The opposite groups must also be kept as much as possible in parallel lines, as the symmetry of the work depends on attention to these niceties."